This beautiful peninsula is known for its splendid coast, steep cliffs, pounding surf, and fine small beaches. 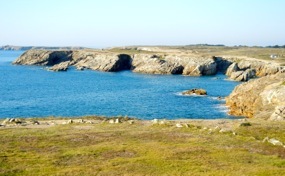 The Presqu'île de Quiberon, or Quiberon Peninsula is a beautiful small (only about 10 kilometers/6 miles from one end to the other) peninsula just south of Carnac, in southern Brittany. Known for its Côte Sauvage, or Wild Coast, on the Atlantic side and its sandy beaches on the Quiberon Bay, Quiberon offers a lot of variety for the visitor. Hiking trails abound across the highlands, with other paths leading to the sea. A number of small settlements have been developed, though the main tourist offerings are in the towns of Quiberon, near the southern end of the peninsula, and St-Pierre-Quiberon, farther north. The southern tip of the peninsula, the Pointe du Conguel, provides panoramic views and lovely walking paths. If you happen to visit during extreme low tides, as we did, you'll see lots of people with nets and baskets, off in search of shrimp, mussels, periwinkles, and other shellfish. Enjoy a seafood dinner while you're there! If you are heading to the coastal islands such as Belle-Île, Houat, or Hoëdic, ferries leave from the dock in the town of Quiberon. Above, Along the Côte Sauvage, Quiberon, France. 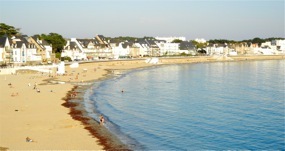 Below, Beach and town of Quiberon.